Yes, I love that tartan! But I'm quite taken by his jacket and waistcoat as well. It's somewhat rare to see him wearing a more traditional waistcoat with points at the bottom instead of his signature flat-bottom cut. Not to mention flap pockets and staghorn buttons; he usually prefers more streamlined modern style jackets. It's a nice black-and-white small check tweed with red windowpane stripes. Not visible from a great distance, but quite lovely close up. 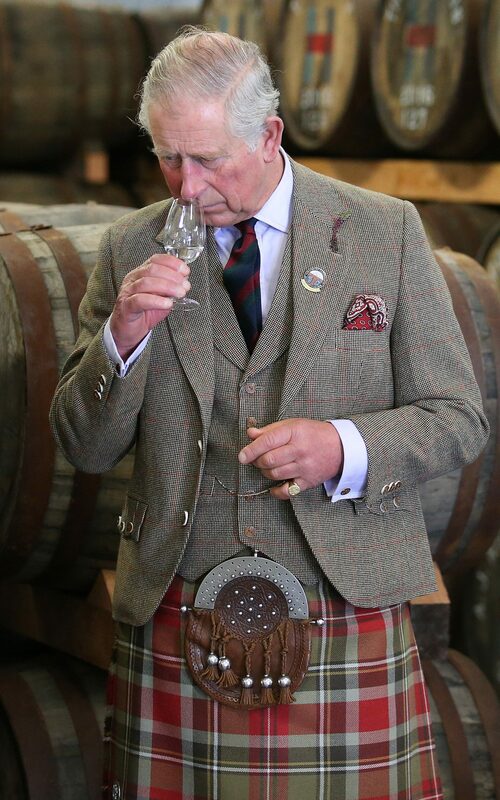 I believe it's the same jacket he was wearing on a similar distillery visit a couple of years ago (with the same kilt). Click the link below for a huge image that shows the detail. Lovely!